One of the most well-known of all apple varieties, Red Delicious is an attractive easy-to-grow apple with a rich sweet flavor. The commercial success and widespread availability of Red Delicious apples have tended to make it unpopular with apple enthusiasts. However, when home-grown and picked ripe from the tree it merits its name, and it is also heavy-cropping and has a good reputation for disease-resistance. The original Delicious is still available, and is known as Hawkeye. It lacks the solid red coloration of Red Delicious, but is considered by some to have a better flavor. Fill in the details below and we will let you know when Red Delicious apple trees are back in stock. Red Delicious became a popular commercial variety because it was easy to grow, cropped heavily, and had good disease resistance - and these are all desirable qualities for the home orchardist too. It makes a good choice for the backyard orchard in all the warmer climate zones - including the east coast, southern states and southern California. Delicious was discovered as a seedling tree by farmer Jesse Hiatt of Peru, Iowa in the 1880s. The tree was not growing in a convenient location and it appears Hiatt tried several times to remove it, but it kept growing back - a testament to its resilience. Eventually he let it fruit and was impressed by the apples. He sent samples to the famous Stark Brothers Nursery, who recognised the potential of the new variety and commercialized it under the name Delicious - Hiatt's original name for the variety was Hawkeye. 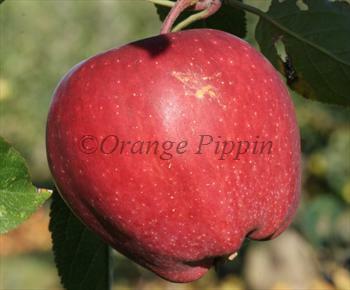 It rapidly established itself as one of the most popular international apple varieties. Red Delicious is the common name for a number of red-colored sports of the original Delicious apple variety, which is red-flushed rather than solid red.